If the fishing world had a Pound for Pound Championship (like MMA does) theredfish would be a contender – right up there with ulua or steelhead or dorado or northern pike as a world class fighting fish. Also known as red drum, channel bass, puppy drum spottail bass, or simply red, scientists know this fish as Sciaenops ocellatus, while sportfishers know the redfish as a beautiful, smart, fighting fish by land and sea – but especially in the shallows. Fishermen come from across the country and as far away as Sri Lanka to fly fish for redfish in Charleston waters, and the question the guides all get is: Is the redfish closer to a trout or a bass? A recent purchase, the Hells Bay Waterman 18 is the perfect boat for prowling the shallows of the lowlands. The boat weighs only 610 pounds and draws 4.5” with engine and fuel. Redfin Charters’ Waterman is powered by a 60 horsepower, four-stroke engine. It seats three: Two anglers and the third is a guide who is the driver, the pusherman and the spotter. That steel cage around the engine on the Waterman isn’t just for protection, it also serves as a high platform for engine-off, no vibration poling through the shallows, and high ground for spotting tailing redfish. .
For redfish, the typical set up would be an 8 weight rod paired with an 8 weight reel and 8 weight, weight -forward floating (WFW) line to match, attached to that would be a 7-9 foot tapered fluorocarbon leader. 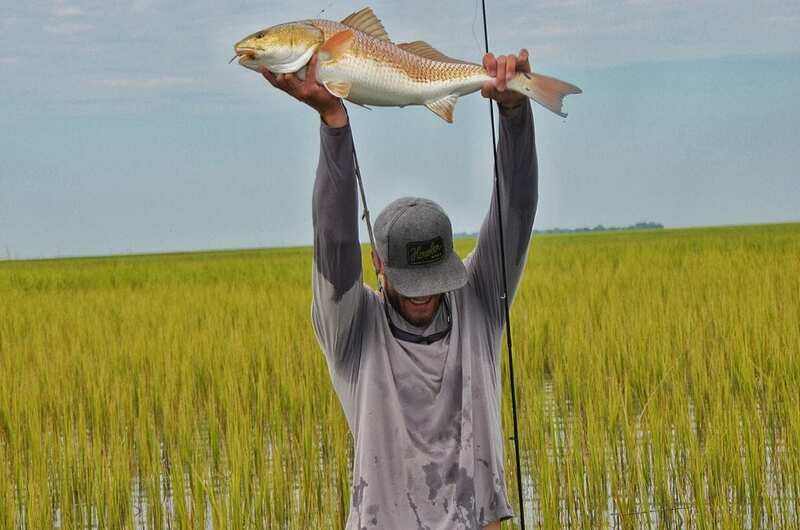 Not to worry, because around Charleston, redfish are thriving although time of the year and tides are also part of the complex equation of fly fishing for redfish. Summer time has bigger tides in the Charleston area – also known as flood tides. At this time, the fish travel up on to hard-bottom grass flat to feed. This is called “tailing redfish” and Charleston is known for this. Prime time for redfish on the fly is fall on a dead low tide coming up, where the water temperature has dropped and the water clarity improves, giving the fish a little more oxygen in the water making them more aggressive. This is when the redfish start to school up.